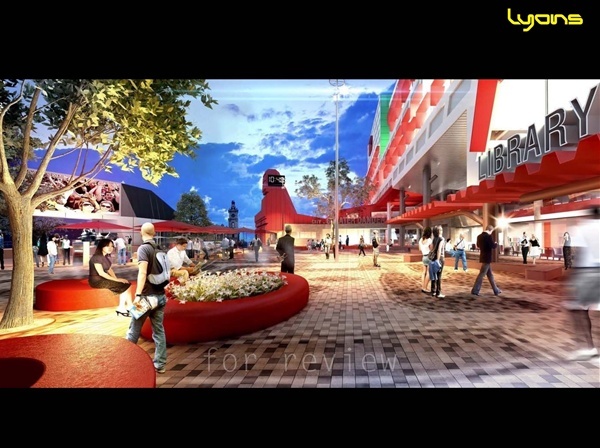 Giant attraction: A view of the civic plaza, showing a stage area, outdoor dining and a huge video screen. FIRST pictures of Greater Dandenong’s planned $62 million civic centre, library and plaza have revealed the council’s desire for a ‘‘Federation Square of the south-east’’. The designs, released this week, show an eye-catching sandstone complex — with a Sphinx-like clock — on the corners of Lonsdale, Walker and Thomas streets. The council hopes the mixture of cafes, entertainment and library will draw crowds day and night from around the region. It is expected to house an events stage and a yet-to-be-funded giant video screen to telecast global events such as the World Cup. 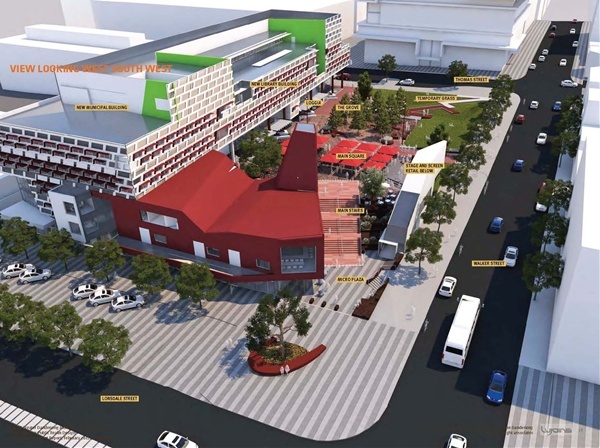 The council is still seeking external funding for the $1.5 million screen, which it regards as a key ingredient of the ‘Federation Square’ concept. The temporary lawn pictured on the corner of Thomas and Walker streets is also yet to be confirmed. The L-shaped lot is owned by Places Victoria. Chief executive John Bennie said one option was for the council to buy the lot. Places Victoria’s plans for the lawn site are unknown. More details in the Weekly on Monday.